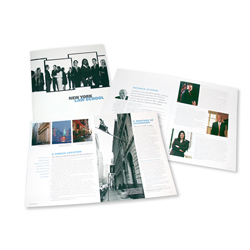 New York Law School, in lower Manhattan has a history of excellence, with graduates during its 116-year history including such notable figures as groundbreaking American poet Wallace Stevens, Supreme Court Justice John Marshall Harlan, and Chester Carlton, the inventor of the Xerox machine. Such a rich history deserves a strong visual presence. Kat Georges took charge of production duties to make the layout shine.